Was born in 1872, and educated at Eton and Trinity College, Cambridge. He succeeded to the title in 1872, at the death of his father. An excellent sportsman, he has for some years been devoted to yachting, and he owns the beautiful s.y. 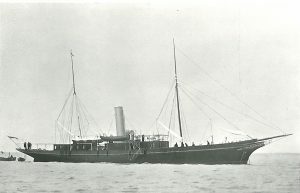 Cala Mara, 313 tons, built by Messrs. Vickers, Sons, and Maxim in 1898 from designs by Mr. St. C. Byrne, and formerly the large yawl Fiona, 151 tons, built in 1879 by Messrs. Camper and Nicholson, Gosport, with which he won the Dover to Heligoland race, 1903. Clubs: Royal Yacht Squadron, Royal Dorset.